Top Pentagon generals are backing a plan for stepped-up rotation of American ground troops to Europe that would increase by 50 percent the US forces available to NATO in the event of a confrontation with Russia. The plan was outlined at a defense forum at the Reagan Library in southern California that Secretary of Defense Ashton Carter addressed on Saturdayafternoon, putting Russia and China on notice regarding the build-up of US military forces in Eastern Europe and the South China Sea. In comments reported by the Wall Street Journal Monday, both General Philip Breedlove, NATO commander, and General Mark Milley, the Army chief of staff, confirmed the planned troop increase. The US military has two brigades on permanent station in Europe, totaling 7,000 soldiers, and the rotation plan would add a third brigade. According to the Journal, General Milley proposed an even bigger build-up, saying he would like to add even more brigades to those rotating to Europe as well as “attack helicopter units, engineering teams and artillery brigades.” This would mean the effective doubling or tripling of the size of the US force deployed to Europe and available for NATO. Many details of the rotation plan remain to be worked out, but Breedlove said decisions would be made “in the next couple of months.” Milley told the Journalthat the Army was changing its training methods to deal with what the Pentagon terms “hybrid war,” the combination of regular troops and irregular forces, as in the Russian operation in Crimea. The Obama administration and the European Union have raised the alarm of alleged “hybrid war,” supposedly a new technique for seizing territory, to distract attention from their own aggressive intervention to overthrow the elected Yanukovych government in Ukraine in 2014 and replace it with a pro-NATO puppet regime. The coup in Kiev, spearheaded by neo-fascist groups backed by the US State Department and CIA, sparked both the Russian intervention in Crimea—whose population is majority Russian and voted overwhelmingly to break with Ukraine—and the rebellion by pro-Russian separatists in the eastern Ukraine regions of Donetsk and Lugansk. Both General Breedlove and General Milley have spoken out in the last few weeks to warn that too much attention is being paid to the new Russian operation in Syria, in support of the government of President Bashar al-Assad, at the expense of the confrontation between NATO and Russia over Ukraine and more generally along the whole extent of Russia’s western border. At a press briefing the week before at the Pentagon, General Breedlove hailed the results of a series of military exercises, involving ground troops, naval warship and fighter jets, conducted under NATO auspices this year. The latest was Operation Trident Juncture, the largest NATO war game in 13 years. He also cited ongoing US involvement in training troops and national guardsmen in Ukraine, which is not a NATO member. He noted that the Ukrainian soldiers “have been on the front line, under fire by the Russians every day.” He continued, “And so, they have a great experience of what it is like to be hit by modern artillery,” which they would be able to share with their US trainers. The two generals also disclosed that the Pentagon plans more training exercises to rehearse the transfer of much larger forces across the Atlantic Ocean against Russian efforts to interfere or disrupt. Such a scenario would follow the outbreak of open warfare on the border between Russia and the eastern European countries that are members of NATO, including Poland and the Baltic states of Lithuania, Latvia and Estonia. The generals called attention to the supposed Russian expansion of what the Pentagon calls anti-access, area denial forces—essentially defensive weapons such as air defense systems and anti-ship missiles—at Russian bases in Belarus and Kaliningrad. The latter is actually Russian territory, an enclave bordered by Poland, Lithuania and the Baltic Sea, likely the first target of any NATO military operation in the region. 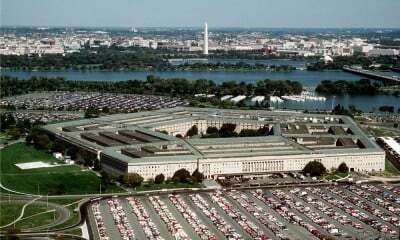 While the Pentagon complains about Russia’s military moves on its own territory, or at one of the handful of bases outside Russia, most of them in the territory of the former Soviet Union, the United States maintains a gargantuan worldwide empire of between 700 and 800 military bases. All other countries in the world combined have less than 30 such bases, according to one recent study. That disparity gives a much better picture of which country is the global aggressor. There is certainly precedent for such a cynical division of labor. However, it is likely that the Pentagon is driving the discussion rather than simply playing its assigned role. The turn by US imperialism towards war, particularly with major potential adversaries such as Russia and China, inevitably strengthens tendencies towards the centralization of power in the hands of the military-intelligence apparatus.